You will be welcome in our lovely and comfortable apartment situated in the heart of Florence! This is a fantastic location, just a few hundred meters from the Cathedral, the Accademia Gallery, the Medician Chapels, the S. Marco Museum, S. Maria Novella Church. Most of the city's amenities and attractions are within easy walking distance. The famous San Lorenzo Market, with its typical Florentine atmosphere and the “Fortezza da Basso" centre of exposure ("Pitti") are very close (5 minutes on foot). You can reach every place of interest on foot. The apartment is located in a beautiful typical quiet street (no traffic noise) at the ground floor of a XVIII° sec. building. It is a self-catering accommodation. It is made up of: a small living-room with a double sofa bed (comfortable double mattress), a well equipped kitchen (kettle is provided), a double bedroom, a second bedroom (2 beds) on request, a bathroom with shower/bath, wc, bidet & wash-basin. A SECOND BEDROOM is available on request paying an EXTRA CHARGE of 10 € per day on arrival. In this bedroom there is a single comfortable bed (80x190 cm), a wardrobe and a small desk. There is also a mezzanine with a single mattress bed above the wooden floor. There is a ladder to climb over so this last solution of the mezzanine is suitable for young persons. The 2 bedrooms, the living-room and the kitchen open to a private charming flowered courtyard (40 sq m). The whole apartment faces the inner private courtyard and not the street so during the night there is no traffic noise even if the street is not busy. Please, note that the courtyard is exclusive for our guests. The apartment is tastefully furnished and it has been recently fully restored. INDEPENDENT GAS HEATING SYSTEM FOR WINTER TIME. Gas heating cost is not included in the price and it will be charged according to consumption. FREE INTERNET WI-FI in the apartment for our guest. Only who lived in an historical centre can know: thanks to the old building technique, walls are massive and thick; this makes indoor temperature spontaneously fresh, even in the hottest summer days. Anyway during the day or in the night the electrical fans can move the air to refresh it even furtherly. The result is that the apartment is naturally fresh and you feel comfortable anytime just using the fans in the rooms . You don’t need air-conditioning that moreover is not healthy. Being the apartment on the ground floor it is easy and comfortable to carry your luggage in. The location of the apartment allows our guests to come back home and having a break during the day, and sightseeing later... without taking any bus or taxi. Arriving by train our guests can reach our apartment from the S.M. Novella railway station easily on foot (15 minutes) without taking any cab or bus, if they wish. From SM Novella railway station our guests can get buses or train to easily reach (and without driving) all the most important towns of art in Tuscany (Siena, Lucca, Pisa, Arezzo). SECOND BEDROOM is available with an EXTRA CHARGE of 10 euro per day otherwise the third and fourth person can sleep on the sofa bed with no extra cost. Price includes all charges except heating cost to be charged according to consumption. We provide bed and bath linen. Extra change is 10 € per person. Check in from 3:00 pm until 8.00 pm. Different time can be arranged in advance with the owner. Arrivals after 8:00 p.m. and Sundays arrivals are possible paying an EXTRA COST of 30 Euros to be paid on arrival in cash, in euros. Sorry, the apartment is not adapted for wheelchair users. Hi, I am Rosy and I will be happy to welcome you in my lovely apartment in the heart of Florence. I am a calm and positive woman. I like reading, music, art, good cooking, a good conversation, trekking. I like travelling and meeting new friends. I try to enjoy life and to live in peace and harmony doing the things I love. I love creative open minded people with positive energy and I appreciate very much the good sense of humor. I am glad to provide the best atmosphere for guests in his city. Being the apartment on the ground floor it is easy and comfortable to carry your luggage in. The location of the apartment allows our guests to come back home and having a break during the day, and sightseeing later... without taking any bus or taxi. Arriving by train our guests can reach our apartment from the S.M. Novella railway station easily on foot (15 minutes) without taking any cab or bus, if they wish. From SM Novella railway station our guests can get buses or train to easily reach (and without driving) all the most important towns of art in Tuscany (Siena, Lucca, Pisa, Arezzo). A great advantage of this apartment is the outside space that is of exclusive use of our customers. The entire apartment overlooks a private inner courtyard (not the road) and that's why at night you don't hear any noise of traffic although the street is not busy. Moreover our guests can relax and eat open air. Being situated on the ground floor it is easy and comfortable to carry in your luggage without having to climb several stairs. 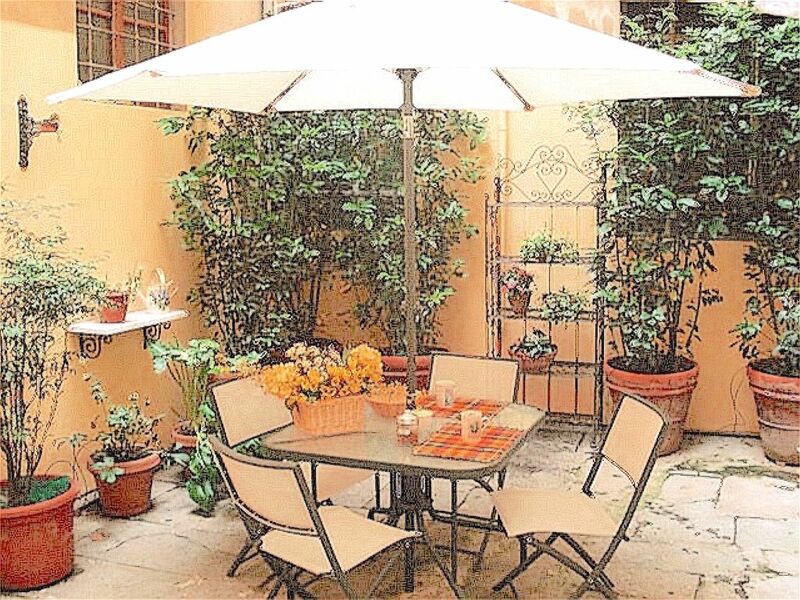 Our apartment is located in an ideal location, close to everything but away from the crowds of tourists, in a typical Florentine neighborhood. Free Internet WI-FI. Bathroom with bathtub/shower, wash-basin, bidet and wc. PLEASE NOTE: arrivals after 8:00 p.m. and Sunday arrivals are possible paying an extra cost of 30 Euros to be paid on arrival in cash in Euros. Price includes all charges except HEATING COST (to be charged according to consumption). BED AND BATH LINEN IS PROVIDED but extra change is 10 € per person. SECOND BEDROOM is 10 € per day, if required. Prices may be subject to change at the owner's discretion. Changeover day: flexible Check in from 3:00 pm until 8:00 pm. Check out by 10.30 am on departing day Different time can be arranged in advance with the owner. Our family of four had a comfortable stay in this nicely decorated apartment for four nights in early January. We had everything we needed, including two toilets which is useful, especially when everyone is taking turns in making the most of the bathtub! The kitchen is well supplied, although the cupboard doors need some repairs. Washing machine seemed noisy but was working. The heating was adequate but the tiled floor was cold and could have done with some rugs (although I’m sure it’s lovely in summer!). The toilet-in-a-cupboard is very cute, as is the sleeping loft in the second bedroom. There are some small extra payments at the property, soyou need to budget for those. We didn’t meet Rosy but she was responsive to my emails and kindly arranged for us to have early access to the apartment on the day of our arrival. We were met by Lucia who showed us everything we needed to know. There is no street noise in the apartment, only occasional door banging from other tenants, and the pleasant sounds od distant church bells and the daily practicing by the upstairs pianist! Convenient supermarket very close by. We really enjoyed staying in this very nice apartment. Both bedrooms had comfortable beds and plenty of blankets as it was a little cool while we were there (two of the three of us are from warm Southern California). For those who like fluffy pillows, you will find the ones provided very firm. Beautiful bathroom, though the overhead shower head refused to stay in place, which was only a small inconvenience. We cooked several meals here. The stove, oven, microwave and toaster all worked great. We washed clothes easily following the directions in one of the several helpful guides left by our host. The taxis are very expensive in Florence, but the buses are easy to take and less crowded than what we found in Rome. It was raining a bit while we were there, so we didn’t get to use the beautiful enclosed patio. But it worked fine to hang our clothes to dry under the umbrella over the outdoor table. Rosy was always available to answer questions on WhatsApp which we appreciated. Thank you for letting us stay in your apartment. Kathy, thank you for your kind words it was a pleasure hosting you. Beautiful apartment and convenient location! I shouldn't really be broadcasting this, but this apartment is a treasure. Near the heart of the city, but sufficiently far away to be quiet and untouristy, with real locals and small ateliers, studios and workshops as neighbours. 8 Minutes walk from the Duomo and only 5 to the Mercato Centrale. Well-appointed with a user-friendly kitchen and a Carrefour Express 100 yards way, we created many lovely Italian meals at home rather than suffer the deluge of the same old 'bistecca alla fiorentia' or pizza identikit menu in virtually every restaurant in the centre. Lovely fresh ingredients on the doorstep - why eat out? Thank you Rosy, we'll be back! We spent a week in Rosy's apartment in Florence. It felt like we were sharing her home! It is well equipped and is conveniently located. We easily walked from the train station and to all of the tourist attractions...the Central Market is a few blocks away and there is a bakery and small grocery store a minute in either direction from the apartment. We appreciated being close to so many things, but being able to escape to the peace and comfort of Rosy's place. Things were very clean and the new bathroom was beautiful! There is a wealth of suggestions and information to help plan your stay. Rosy promptly answered our emails and answered our many questions. The apartment is a great base for a visit to Florence! Many Thanks to all of you for your lovely review, it really means so much to me that you enjoyed your stay. Would love to see you again in the future. Thanks once again.....Take care and Best Wishes. We stayed in the apartment for 3 weeks during April. It is comfortable and has a home-like feel. 10 minutes easy walk to train station and a bus stop 200 metres away. All amenities and a little courtyard. Three adults more than comfortable. Stayed here for 12 nights. The apartment is exactly as described, clean and with more than enough facilities available. It had a very cosy and homely feel to it. The kitchen had everything that was needed for cooking and the bed comfortable. Being winter we didn’t take advantage of the courtyard. The pressure for the hot water was weak but I’m assuming that might be common in the older buildings. Rosy was a very lovely and charming lady. The information on the use of the facilities was very detailed. Location was perfect, easy to walk from the railway and to all of the sights in Florence. Thank's Robert for the nice review. It has been my pleasure to meet you. 100km from Viareggio (Versilia) easily reachable by train. Pisa airport (100 kms; 1 hour drive). Nearest ferry port: Livorno (120 kms). Nearest motorway junction: Firenze Sud, Firenze Nord (both for A1). Car is not necessary in Florence. Our apartment is ideally located in a very convenient area of the centre of Florence because everything is handy: the Accademia Museum, the Cathedral, the Cappelle Medicee, SS. Annunziata, San Marco etc. You can reach every place of interest on foot. The location of the apartment allows you to come back home and having a break during the day, and sightseeing later... without taking any bus or taxi. On arrival/departure our guests can reach our apartment from the S.M. Novella railway station easily on foot without taking any cab or bus, if they wish. From SM Novella railway station our guests can get buses or train to reach easily (and without driving) all the most important towns of art in Tuscany (Siena, Lucca, Pisa, Arezzo). The S. Lorenzo central market is just 1 block away. Restaurants and every kind of shops are just close to our apartment. Very close to the flat are a well-stocked mini supermarket and also a lovely local bakery/delicatessen. Changeover Day: arrival and departure days are flexible. Check in from 3:00 pm until 8:00 p.m. Check out by 10.30 a.m. on departing day Different time can be arranged in advance with the owner. Extra charge of 30 Euros for Sundays and late arrivals (after 8:00 p.m.) Notes on prices: Price includes all charges except heating cost (to be charged according to consumption). In case of 2-3 nights stay heating cost is included in the price. Prices may be subject to change at the owner's discretion.